Desert doe caught by the two-handed rod of Beau Purvis. THE BUDDING, ENTHUSIASTIC steelheader, if he or she is truly passionate about the sport, will be all ears and eyes when in the presence of more-experienced anglers. If it’s in his nature he’ll read anything and everything he can get his hands on pertaining to steelhead. Inevitably, the beginner will soon be subjected to and haunted by steelheading cliche: “The fish hit me like a freight train!” “I mean, he just took the fly like a bolt of lightning!” “She took like a ton of bricks!” “Oh man, that fish absolutely crushed my fly!” And on it goes — the many superlative descriptions of how a steelhead takes a fly. It gets my blood boiling just thinking about it. These kinds of takes do occur, and there’s nothing more exciting than swinging your fly after hours of fruitless casting when you are violently blindsided by a crushing blow from a freight train that was shot out of a cannon and hit you like a ton of bricks. Yeah, baby! The fact is, yes, sometimes the steelhead climbs all over the fly and hooks itself, but more often the fish needs time to turn with your fly and swim away with it, thus allowing the hook to make purchase. The steelhead is not aware that the fly is tethered to an anchored string — all its life, when it inhaled or mouthed food, the stuff goes right in. No problem. We as anglers need to be aware of the physics behind this and let the steelhead take the fly. I’ll say it again: LET THE STEELHEAD TAKE THE FLY. A hair-trigger strike response is the nemesis of many a good steelheader. As Bill McMilllan told me long ago, imagine dangling a fly tied to a piece of monofilament in a toilet bowl. Make sure there’s tension on the fly — no slack. Now flush the toilet. As the toilet is flushing simultaneously pull up and back on the fly. What happens? Your fly pops out of the toilet as the water goes down. Do it again. This time, as the toilet flushes, drop your arm a bit. Don’t pull back. The fly disappears. The same thing needs to be practiced with steelhead. Not only should you wait for the steelhead to make its turn with your fly, you need to incorporate some slack or loose line in order for the fish to turn freely, taking the fly with it. This delayed reaction to a take is especially necessary when fishing a floating line. The floating line rides in the upper current which is usually faster than subcurrents. Your fly, whether riding right on top or barely subsurface, usually stays in line with your line within inches. You can see there’s little or no slack in the system to allow the steelhead to pick up your offering and turn before you see it. There are several methods experienced steelheaders use to allow the steelhead a free turn with the fly. One is simply allowing the steelhead to take the fly without lifting the rod too soon, which in my opinion leaves too much room for error. Another is to fish with a raised rod tip, which creates slack line as the line from the rod drapes and sags to the water. This affords the steelhead plenty of slack to turn, but I prefer to fish with my rod tip as close to the water as possible — it helps me feel what the fly is doing. Some anglers fish with a high rod tip and actually drop it to the water when they see or feel a take, lifting once they feel the fish a second time, confident he’s made his turn. I’ve met others who fish with a very loose drag and simply let the steelhead peel some line off the reel before lifting. I have experimented with all of these techniques plus a few more. For me and the hundreds of anglers I have guided — some of enviable experience who have taught me a thing two — carrying a loop of line between the reel and rod hand, and allowing the steelhead to pull it out until it comes tight to the reel is the most efficient, fail-safe method there is. Follow along with the illustrations, and I’ll tell you all about it. The first thing is you need to carry a substantial loop, not just several useless inches as I see a lot of people fishing with. You want the loop to be at least the length of a fair-sized steelhead, say, 30 to 36 inches. Cut this in half and you get a loop hanging 15 to 18 inches below your reel. That length is usually sufficient, but I sometimes use more. If the water I’m fishing is a little deeper than average, I’ve found that the steelhead needs a little more line to take down with him. Also, if you’re fishing a river where the average steelhead is large — say, the Thompson or Babine in British Columbia — a larger loop is an advantage. I recommend getting in the habit of forming the loop before your fly is doing its fishing business. Form it early, immediately after your initial mend. You want this loop to be secured and ready to be snatched up through the entire course of the swing. Pull the loop in from the cast line, not the reel, for two reasons. One is you want the loop to be free of kinks from memory. The other is if you pull 30 inches of line from your reel, by the time you’re halfway down the run you’ll have way too much line out. Common sense, I know, but I’ve seen it happen many times. The index finger of my rod hand controls the loop. It’s what I pull the line through to form the loop, and it’s how the loop is pressed lightly against the rod to keep it secured while fishing. 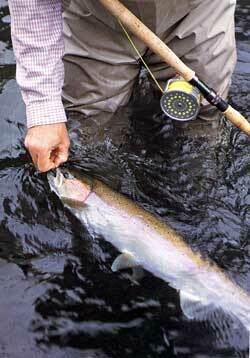 Notice I said lightly pressed against the rod — you want it loose enough so a steelhead can pull it out. Practice this with a friend. On dry ground, form a loop and have your buddy pull it out at varying degrees of slow and fast. This will help you get a feel for it. It should go without saying that while the loop is being pulled out, whether it by a steelhead or your buddy, DO NOT TRY TO SET THE HOOK! You will be defeating the purpose of the loop, and you’ll pull it away from your fish nearly every time. DO NOT TRY AND SET THE HOOK! You really need to pound this into your head. One of my guide sayings in trying to convey this message to my clients is, “I’ve never missed a steelhead by waiting too long.” It’s true, but I’ve missed plenty trying to set the hook too quickly. The impulse to clamp down and rear back is strong. It’s entirely up to you how you handle it: Lift the rod, and your chances of missing the steelhead dramatically increase, or let him take the loop out nearly guaranteeing a solid hook-up. Be prepared for the loop to go out so fast you don’t even have time to mess it up, to so slow it seems like it will never go out. No matter how slow it seems, the right thing to do is NOT SET THE HOOK. Every time. The loop goes out, and the line comes tight to the reel. Awesome. At this point you still shouldn’t be in a hurry. Try to remain calm. I know, the house is on fire and the tsunami’s on its way. Remain calm. Yeah, right. Just remember: The more you are in control of your actions, the greater the likelihood of a successful hook-up. Once she’s good and tight, maybe even the reel clicking a bit, pinch the line against the rod. Line pinched against the cork, raise the rod up and toward your bank to drive the hook home. You don’t need to give it a gorilla set. Lift the rod with some smooth authority, but there’s no need to overdo it. Each encounter is different, with some steelhead taking hard and fast, others slow and subtle. You need to raise the rod accordingly. When Mr. Steelie hits with an electrifying jolt, he pretty much sets the hook himself. Heaving the rod tip up as if setting up on a halibut will usually result in a break-off. Bad. A simple lift does the trick; the fish will probably be off to the races anyway. A slow take usually requires a sharper lift. If you have the presence of mind to do it, it’s good to lift the rod toward the bank you are fishing from. Steelhead typically take the fly from the inside out, resulting in the fly finding purchase in the corner of the jaw closest to your bank as he swims with it back toward center river. 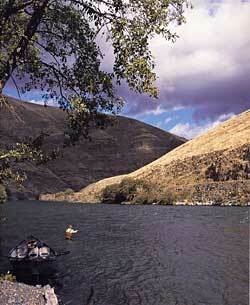 It makes sense to pull the hook in the opposite direction the steelhead is going. Okay you’ve got him! Get your finger off that line, and let’m run, let’m run, let’m run. Wish I had a buck for every time I yelled that out. Most steelhead take off on a strong, long, screaming run as soon as the rod is raised and they realize they’re in trouble. Hang on, and let it go. If the fish doesn’t run, you need to get reeling fast in order to keep the line tight and the hook from falling out. This often spurs the fish into a panic that makes it run. The main thing is to be ready. Once you raise the rod, something will happen.